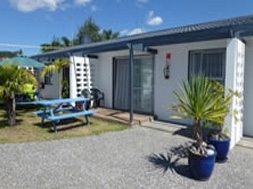 MANA-NUI MOTEL Whitianga, has a total of 12 ground-floor units set on a large open sunny site in the middle of Whitianga township, Mercury Bay, Coromandel Peninsula. 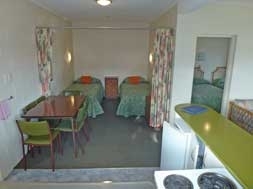 The site is situated on the northern end, eastern side, of the main shopping precinct making it the closest motel to town. 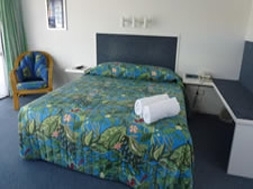 The motel accommodation has 5 older-style classic concrete block interior refurbished units, which are larger and more suitable for families, and 7 newer studio units suitable for 1 or 2 persons. The units are clean and offer a comfortable, pleasant stay at a competitive, affordable price with ample free on site parking for each unit. 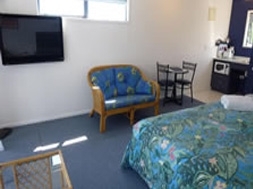 Large studio units each with a super king-size bed, large LED LCD TV, standard shower and bathroom facilities, small dining table, chairs, lounge furniture, kitchenette with microwave, microwave ware, toaster, electric jug in each unit. Outdoor furniture directly in front of each unit. 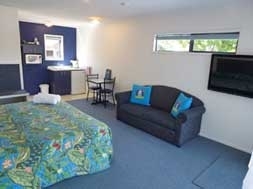 NZ$125 - $210 per night, seasonal, 1 or 2 persons. Twin studio unit with a super king-size bed and single bed, large LED LCD TV, standard shower and bathroom facilities, small dining table, chairs, lounge furniture, kitchenette with microwave, microwave ware, toaster, electric jug in each unit. Outdoor furniture directly in front of unit that overlooks the pool. 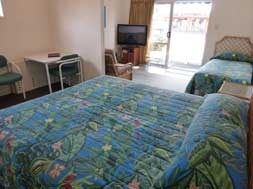 Access studio unit with 1 x super king-size bed. Bathroom has wheelchair access to wet floor shower, fold down seat, handrails toilet facilities. Kitchenette has a fridge, microwave, microwave ware, electric jug and toaster. Dining table, and chairs. Large LED LCD TV. Ramp and parking outside unit. 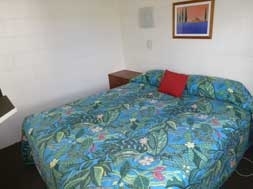 This large twin unit has a super king-size bed and single bed. Large LED LCD TV. 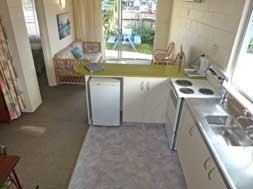 Separate kitchen with hot plates and microwave facilities, electric jug and toaster. Standard shower in bathroom with a separate toilet. Dining area and lounge area. Own outdoor seating area. This unit fronts the street. A queen-size bed and single bed in the bedroom plus 2 single beds in an enclave curtained off from the kitchen, dining area. 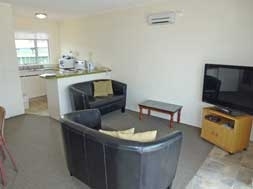 A single couch bed in the lounge, with a large LED LCD TV in the open-plan living area. Access unit for families or supported persons. 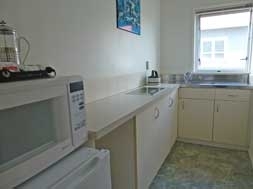 Full kitchen (oven, hot plates, microwave, electric jug, fridge). Large bathroom, wheelchair access to wet-floor shower,handrails and fold down seat. Toilet with handrail. Own outside bench seat area directly outside from lounge. This unit fronts the street. These family units have a king-size bed in one bedroom and 2 single beds in the other bedroom. Full kitchen facilities (oven, hot plates, microwave, fridge) large LED LCD TV , the dining area and lounge are all open-plan. Standard shower and bathroom facilities in all two-bedroom units. 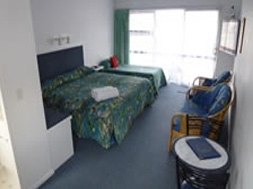 All units have toilet facilities, hand basin, showers, large flat sceen LED LCD TVs, including most standard motel items being available. 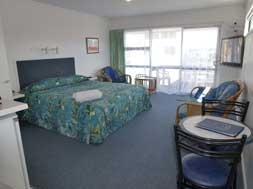 2pm on day of arrival or sooner if room is ready and available. Managements discretion. 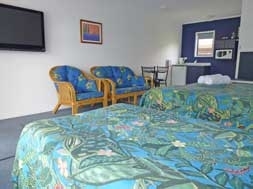 10am unless prior arrangement and availability allows a later check-out. Charges may apply.